Daylesford and Hepburn Springs are teeming with natural beauty and provide lots of opportunities for sight seeing and walking. There are numerous short walks starting from Lake Daylesford, allowing visitors to see much of the beauty of the area. For a bit more fun you can even hire an electric bike in Daylesford. More adventurous walkers won’t be disappointed, with longer forest trails starting from Lake Daylesford and Hepburn Mineral Springs Reserve and taking walkers and mountain bike riders as far as Vaughn Springs, Fryerstown and Castlemaine. The tracks along the Dry Diggings Track and Goldfields Track are not recommended for novice walkers or mountain bike riders, as they include very rocky terrain and deep gullies. One of the most popular places to visit is Lake Daylesford. The lake was built in 1928 and opened in 1930. It’s the perfect place to start your exploration of Daylesford and the surrounding area. By far the best time to visit the lake is in spring and summer, but if you rug up, crisp, sunny mornings in winter can be pretty special. There are a number of entrances for walkers to get to Lake Daylesford on foot, but the easiest way is by car via Bleakley Street. This takes you straight to the Boathouse. 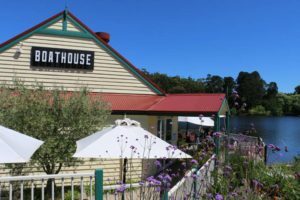 Enjoying a coffee and some lunch overlooking the water at The Boathouse Cafe is a great way to finish off your journey, after exploring the mineral springs and tracks in the area. For those who love books, the Bookbarn, opposite the Boathouse sells a range of interesting second hand books. 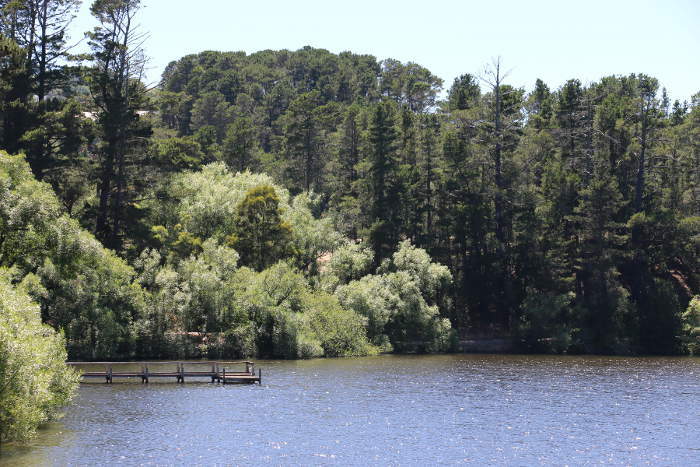 To appreciate the full beauty of the deciduous trees, birdlife and views around Lake Daylesford, visitors can do a full circuit of the lake, known as The Peace Walk. Walkers can start at the Boathouse carpark, or from paths located around the circuit that take walkers into Daylesford. During sunny, warm weather, you’ll find plenty of lovely photo opportunities and pretty places to stop for a picnic and feed the ducks. Walkers pass the spillway and historic bathing change rooms on their return to the Boathouse. A swimming pool with a diving platform was originally located here and was popular with locals and visitors, but has long since been removed. 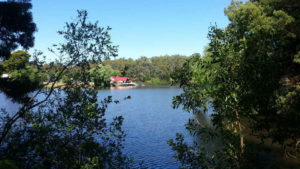 Central Springs Reserve is a picnic area near the Boathouse. The Reserve has four mineral springs, where visitors can fill a water bottle and sample the natural, slightly effervescent mineral waters that come from deep within the ground. Daylesford and Hepburn Springs are famous for their natural mineral waters, which have been attracting visitors for well over a century. Captain Hepburn was the first European to find a natural spring on his land in the 1830s, prior to the exploration of the land in the Gold Rush. Tipperary Walk is another easy trail that takes walkers from Lake Daylesford to Hepburn Springs, past natural mineral springs and old gold fields. It is a gentle 16 kilometres, taking about 5 hours to complete and bringing visitors to Hepburn Mineral Springs Reserve. This walk traverses country from Hepburn Springs to Porcupine Ridge and is around 14 kilometres, providing great views over Mount Franklin – an extinct volcano. This walk starts from Mineral Springs Reserve in Hepburn Springs. At the end of a long walk or ride along the trails, treat yourself to a therapeutic massage or spa. The famous Hepburn Springs Bathhouse offers public and private bathing in hot mineral springs, as well as a range of massage and body treatments. Pour yourself a glass of wine and make up a cheese platter and soak in a deep spa in your luxury accommodation, as you gaze out across the trees. Your muscles will thank you. There are lots of options for accommodation in Daylesford and Hepburn Springs. The area is known for its boutique B & Bs that provide accommodation in ultra modern villas, rustic Victorian country houses and quirky artists homes. For accommodation in the heart of Hepburn Springs, Saffron and Horizon provide all the luxury amenities in stunning architect designed villas, overlooking the Hepburn Mineral Springs Reserve. Each villa has two bedrooms, luxury hydro spas and fully equipped kitchen. An enormous open plan lounge and dining area with fire place invites guests to kick back for a weekend or a week and explore this beautiful part of the world. Kookaburra Ridge is a large house with three bedrooms, set on two acres of gardens. The house is a garden lovers paradise, with fruit trees, grape vines, roses and herbs. The garden comes to life in spring and has a huge verandah – perfect for entertaining al fresco. We regularly provide articles and reviews for visitors about what’s happening and great places to visit in the area. Keep up to date by following our Facebook page, where we run regular competitions to win two luxury nights accommodation staying in Hepburn Spa Pavilions.